I never intended to collect things. are nice to look at too. And thus a collection is born. so you can actually look at them. you would have never even thought of. is more things I like to look at. My collections haven't started thinning yet, every time I come home with something new, my husband reminds me we should be downsizing. I realized that last year when we redid our living room and needed something to put on top of the library shelves. Why not put big frames with my photographs up there along with my vintage camera collection. I have so happy to look at them every day. Great idea with the hankies. Oh those hankies are so pretty! And they hardly take up any room. You can collect hundreds of them! I have a collection of Steiff animals, mostly from my childhood, very few were acquired recently. I did not get the collector gene but my mother had an over sized one.. she had a collection of hankies like these and i wish we had seen this photo. she would have loved to display them in any of her collection of vases.. I have teapots that I adore, some of which were given to me by grandmothers and my mother. I also have some Lladros, gifts from hubby. Very creative display and elegant photo! As a kid I collected turtles, mainly stuffed animals of sea turtles. Some of my favorites are in my apartment now, but I've never been one to style my living space with collections. That is a very pretty display. I have a collection of shot glasses from places I've traveled but I don't collect them anymore. I also have a collection of piggy banks but nowhere to really display them. And of course, you already know about my collection of vintage postcards. I have actually thought a lot about collections and how personal they are to the collector. Both my mom and mother in law collected things ( plates, Hummel figures, genealogy items) . While I understood why they liked them, they didn't interest me as something I would like to continue. I seem to have a a few collections going myself...geodes, shells and feathers. And Boston Terriers. My sister has paper weights . Funny, I'm not sure how it started, but I enjoy them. 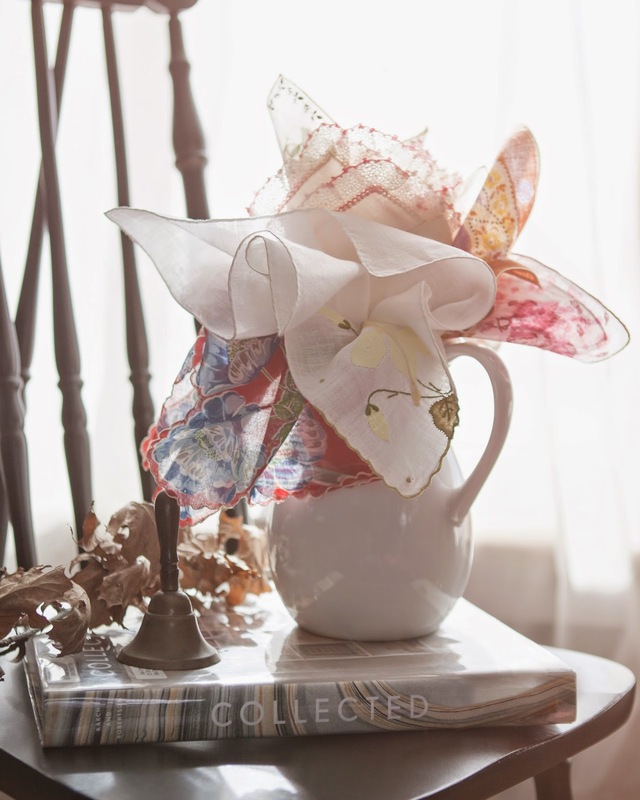 I love how you displayed the handkerchiefs I've enjoyed looking at your blog today! oh yeah I love blue decorated salt glazed stoneware. Oh, it always starts out innocent enough - just one ... but you need at least three to properly balance it so more must be acquired. Yea, you're singing to the choir. Lovely still life (which is that hook at the end of the stick for why so many of my collections exist). I hopped over to visit you from Sandra's blog. She thought your idea was so sweet and it is. I used hankies in the same way and in other way's as well. I like topping lamps with them sometimes. All sorts of things. I don't collect them..I mean I don't have dozens of them. Yours are so pretty. I always go for the ones with a bit of crochet on them.. I don't have large collections. At one time I began a collection of cups and saucers..then Beatrix Potter stuffed animals, then Gobel bunnies..etc. etc. I just don't collect into a huge bunch. WAIT!! I collect crocheted piecies..doilies that are only handmade..and I am used them more and more. I have a dresser that I used for them. I keep them all starched and ready for use. I am less shy about how I decorate and do it for me rather than what is popular and what is considered "correct"... I've stopped trying to please others so much. Is that selfish? LOL Probably but it's fun and give me a lot of pleasure. It's a hobby. I loved visiting you. I SHALL return!! I am going to check out the book you mention. It sounds like it would be fun to look through. That's a very pretty and clever way to display your vintage hankies. I don't actually collect any one thing. I have a milk glass candy dish and I could easily collect more pieces of that but I never see any over here - I bought my dish on holiday at my sister's in Arkansas last spring. Oh, I do seem to be collecting Trollbeads at the minute after getting a bracelet for my birthday last September. I've enjoyed visiting your blog today. Your photograhy is amazing. I love the water drops images and also those of your son playing proper football! Oh yes. Too many things to look at in my house. But, I still love them. Love yours too. Cute idea to make a bouquet with your hankies! I have mine in a glass jar in my sewing room so I can look at them every now and then. Last summer I took some out and hung them as a banner across my fireplace. Loved seeing them. Oh my, I certainly don't need to see more ideas to collect. I already collect too many things. lol! This is lovely! I used to collect blue and white pottery while living in Asia as well as celadon. I don't really have any active collections of late, but I do have an affinity for vintage mason jars. Those hankerchiefs are beautiful! Love the light in the photo. I collect mugs/teacups and teapots. But I really need to slow down, there is only so much space and one can drink only so much tea. What a great way to display them! I do not have one specific type of collection, but I love old thing handed down through the family. My grandmothers hand made linens, MIL wooden child rocker, my husbands grandmother old mini pitchers and decorative dishes, cast iron pans, pickling crocks etc etc. Gosh it kind of sounds like a hodge podge of things but we love them. Lovely photo and I love the way you've displayed them. What a neat book too! I used to collect teddy bears, still buy the odd one or receive them for gifts. I had so many I had to donate them to our local Teddy Bear Picnic they have every year. They were thrilled to have them and I was happy to pass them onto a good cause. Good Advice and what lovely handkerchiefs. I really, really try not to collect anything. Very non-womanly I totally fail when it comes to electronic gadgets e.g. cameras, computers, phones and tablets - LOL. But I certainly love the idea that collecting is one thing, but displaying the collection to enjoy them even more is something equally if not more important. Lovely display of the vintage handkerchiefs. Thank you for linking up!! a bouquet of hankies!! what a lovely and beautiful idea. just love it. I don't really collect anything -- aside from my photography and poetry I guess. I am not much for "things" -- although my mom has always bought me cute penguin things she finds because I do love penguins.